I LOVE romance, it makes my heart flutter, my cheeks blush. For this sweet and simple necklace I was inspired by the Blue Moon Bead Love pendant. Using a black braided cord, I attached the Blue Moon Bead Pendant with jump rings. 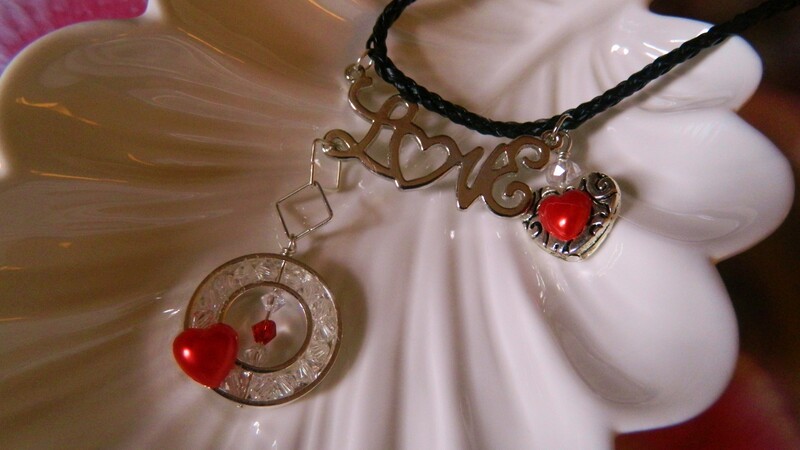 Then a simple silver heart with a pretty red heart glued on. For the other dangle, I used a Katedid pendant that I filled with 4MM clear swarvoski crystals and glued another red heart to the Katedid. 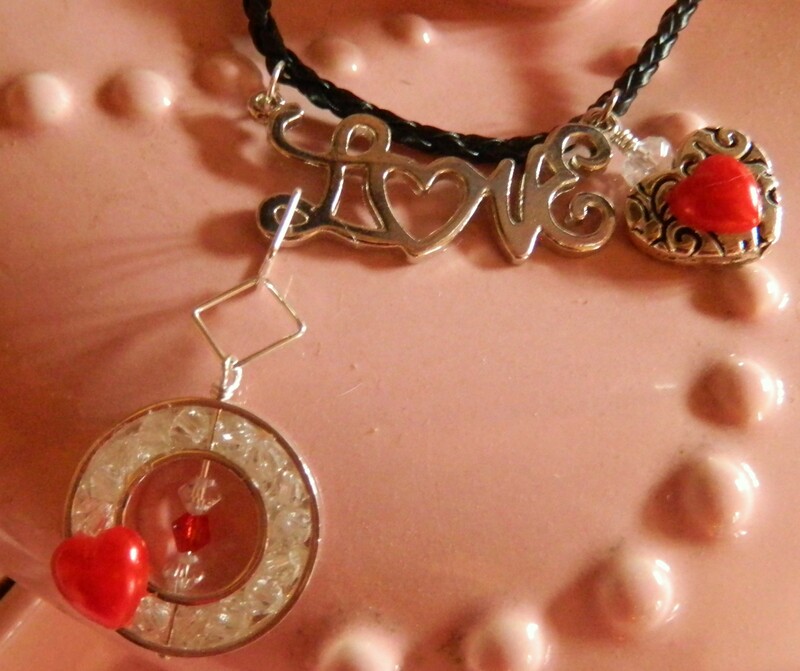 Using a head pin I ran it thru the Katedid attached two 4mm clear swarovski and one 4mm red swarovski crystal made a wire wrapped look, attached it to two square jump rings which I attached to the Love pendant on the opposite side. Such a simple gift of Love to give to that special someone. Earrings, Earrings, Earrings, a girl can never have enough earrings. Small one, big ones, big hoops, little hoops, sparkles, bling, earrings that jingle, earrings that make you smile. Earrings for a fancy dinner party or to wear dancing. We women need earrings for every outfit we own and then we still need more. Here are three designs that I recently created using Blue Moon Beads. Using the Blue Moon Bead Branch goldtone earring findings and the goldtone discs in my stash I attached those and Blue Moon Bead Pink and Mauve colored acrylic beads. These turned out so cool and I can’t wait to wear them out and about. These Blue Moon Bead Ear Cuffs are just the coolest thing I think I’ve ever designed. When I got them I squealed in delight, I have been looking for ear cuffs for months at the craft store. These were so much fun and so easy. I used small black cable chain and draped it under black and opaque white swarovski crystals. Added more black chain and dangled the butterfly, white flower and silver flower from the bottom of the each chain. There are going to be my go to earrings for spring and summer. How about these Disco Ball earrings, don’t they just yell a fun night at the club dancing? Using the Blue Moom Bead glitter beads (tip: a little spritz with hair spray will keep the glitter from wearing). I made my own chain from black and silver jump rings, attached the beads I had placed on head pins and next I’m dancing the night away. Hope you enjoy these designs and they give you inspiration for your earring projects. Please feel free to leave your comments, I enjoy hearing what you have to say.